Hot dogs remind me so much of my childhood. After school especially while waiting to be picked up from the bus stop, and you know my mama was always late! Actually I can bet you all had a mum like mine… You remember sitting at school for 3 hours with the watchman waiting for your mum to pick you up? no? okay how about sitting in the headmistress’ office till 7pm, eating House of Manji biscuits because mummy had forgotten to pick you? We have all been there, it is just one of those things that you had to go through growing up! I digress. My sister and I used to get dropped off at Sarit Centre Shopping Mall, so we kept ourselves entertained, along with the other forgotten kids.. But the one thing we always had, was enough money for a hot dog from the ice cream shop, you know the one next to the flower shop? !50 bob for a plain one and 80 bob for a special. 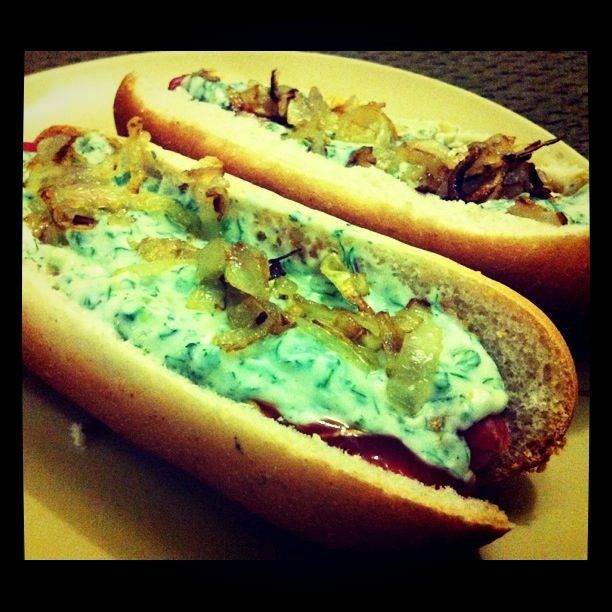 I obviously always had the special, with everything; ketchup, mustard, relish, grilled onions, garlic sauce, and this tzatziki looking sauce, I’m not sure what was in it, but it was gooooooood! ketchup, not tomato sauce, ketchup! mustard, good mustard, not cheap sand-tasting mustard, you must invest in good mustard! Start by caremelising the onions. This should take you about 30-40minutes. Yes I know, all that time for caramelised onions?? But it is worth it, trust me. Place a little oil in a large pan over a medium heat, add the onions and saute. Sprinkle salt once they start to soften, and a dash of sugar (I read this somewhere that it helps the process along). Leave to caramelise, stirring every so often to make sure they don’t burn. A splash of water halfway through will also stop them from drying out. Once they are done, they should be a deep golden brown colour. Next get your tzatziki out the fridge, well you probably should start with that. Boil the dogs in water for about 8minutes. take them out, dry them on a paper towel. If you feel even more inspired, pop them under the grill for a few minutes. The bread, slice it down the middle, but not all the way through. I find hot dog buns really bready, I mean the bread is a supporting role here, the star is the hot dog and the toppings… so I hollowed out the buns. Now assembling is the fun part! Take your weiner, place it in the bun. Start with ketchup; do the wiggely line thing, go on you know you want to! then mustard; wiggely line again! Next spoon in the onions, lots of them, stuff in as much as you can. Last but not least, pour over lots and lots of tzatziki! season with salt and pepper, a little more onion on top and you are good to go! This will get messy very quickly, so have lots of napkins on hand. Make them, let me know how it goes, and if you too channel Bernie Mac. Stumbled across your blog 2day. Great stuff. I connect esp. coz i love all-things-food. Want [more like need] personal lessons on some of your recipes. Can we strike a deal? Please….pretty please…? That Ice-cream shop at Sarit closed down…:( . I always faux caramelize my onions in the microwave…;-). will try this soon. LOL! trust me I was also fasting… and it is not easy! But I had to break for a few days. I am with you in spirit:) Ramadhan Kareem dear! Grace sound xtian n u fast during ramadhan? nice one…Thanks n Saum Maqbul! yeah I’m fasting… supporting the boyfriend! trying to be a good girlfriend… LOL! Nice one…keep it up…lucky fellow! i love the recipe,will try it out soon….but whats tzatziki in kikuyu?? Thanks Michael! I have no idea what it is in kikuyu… But will find out and let you know!